KL Rahul finally found some form as he played some delightful strokes on his way to 44 runs before once again throwing away his wicket playing a reckless shot, thus sending Twitter into a trolling frenzy. 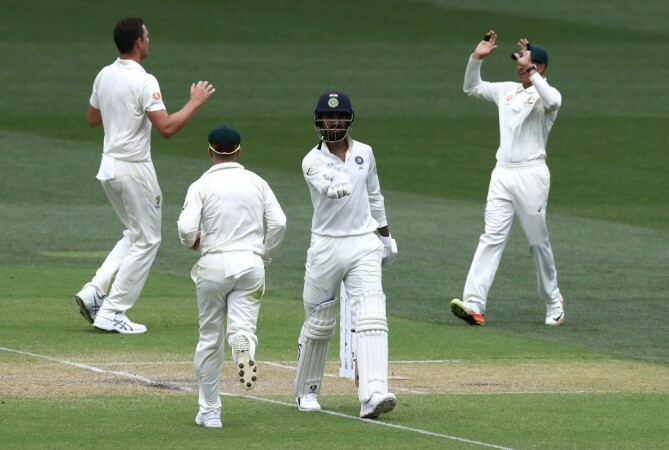 KL Rahul cannot seem to catch a break these days and the Indian opener was not spared from criticism once again as he was dismissed for 44 in the second innings of the first Test against Australia at Adelaide. India had dismissed Australia for 235 earlier in the day courtesy a wicket from Jasprit Bumrah and two of successive Mohammed Shami deliveries to afford themselves a slender lead of 15 runs. In their second essay with the bat, the Indian openers started out cautiously before Rahul opened his arms. The 26-year-old took a special liking to Pat Cummins cover driving the pacemen for a six and four to the boundary. The two even had a brief chat with each other. Rahul even pulled out a reverse sweep to counter the threat from Nathan Lyon. But just as he looked set and comfortable, he played a reckless shot to throw away his wicket. This displeased his detractors on social media and there seems to be no shortage of Rahul's naysayers these days. Since when Australia have started importing Indian pitches??? 2 - People who defend KL RAHUL ??? These guys indulged in some banter. India should think of scoring around 350 runs in this innings. #AUSvIND @cricketaakash @iamsid_vasu @SirJadeja what do u think? Rahul's opening partner Murali Vijay was dismissed for 18 and the pressure continues to mount on him as he has scored only 100 runs in his last 12 innings. The Test match is very evenly poised with skipper Virat Kohli and Cheteshwar Pujara showing commendable patience at the crease in front of some very tight bowling by the Aussies.